The proverb beloved of development professionals everywhere goes like this: give a man a fish, and you feed him for a day. Teach a man to fish, and you feed him for life. But what if there aren’t enough fish in the sea? 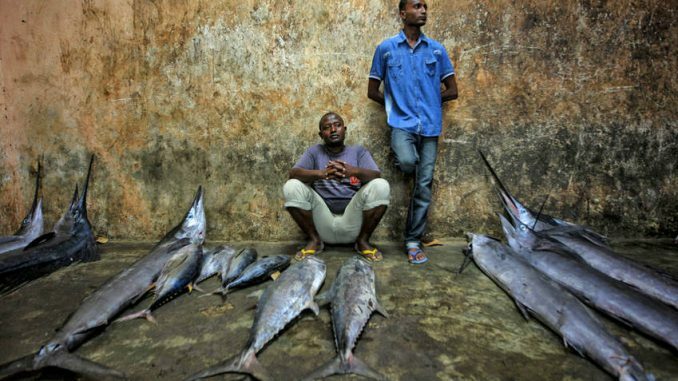 The long, jagged Somali coast is home to one of the richest fish stocks in the world. It is teeming with schools of tuna, sardines and mackerel, and there’s plenty of lucrative lobster too. In the late 1980s, word began to spread about this extraordinary piscine bounty. Soon Somali fishermen no longer had their coast to themselves. Trawlers from the Arabian Gulf, from India, from as far afield as Japan, South Korea and Spain, were descending on the Gulf of Aden with their massive nets and advanced techniques. By the mid-2000s, that bounty wasn’t quite so plentiful. Somali fishermen, some from families who had fished these waters for centuries, could no longer compete. Their nets were empty. Enter the pirates. In research into what precipitated the rise of piracy off the coast of Somalia, Oceans Beyond Piracy were told a consistent story by local communities. “One additional, overriding driver of piracy was pointed to by every single respondent, and generally characterised as the fundamental grievance: illegal fishing. The perceived impact of illegal fishing can hardly be overstated, and the topic dominated responses in a large majority of interviews,” said the advocacy group. “There is little doubt amongst Somalis that conflicts like these provided the original impetus for what became the piracy phenomenon. In the local telling, illegal fishing, and the economic damage it inflicted, left traditional fishing communities so angered and impoverished that they began attacking the illegal fishing vessels, acting as a sort of militia coast guard. However, criminal gangs subsequently saw the profit potential and started hijacking more valuable commercial ships unconnected to illegal fishing,” explained Oceans Beyond Piracy. These findings should be taken with a pinch of sea salt. Piracy was never just about illegal fishing. It was also intimately connected with chronic conflict, poverty and instability, and was fuelled too by the Islamist militant group al-Shabaab, who profited from ransoms. But we shouldn’t be too surprised that pirates themselves preferred the justification provided by the illegal fishing explanation, which lends a noble sheen to what is fundamentally criminal activity. “The common argument put by pirates is that illegal fishing is a direct cause. It’s a balm for the conscience in a way, a legitimisation of the decision to go to sea. Because of the power of that explanation it became a fundamental part of all pirates’ justifications,” said Timothy Walker, a maritime security expert with the Institute for Security Studies, in an interview. As attacks on ships increased, the waters off Somalia became a no-go zone. At its peak, 47 merchant vessels were hijacked, from a total of more than 200 attempts. It was costing the global shipping industry in excess of $6-billion a year in added security costs and inflated insurance premiums. A global naval flotilla was put together to protect ships and combat the pirates. For all but the bravest illegal fishermen, fishing off Somalia became more trouble than it was worth. It was simply too dangerous. And without the illegal fishermen, fish stocks began to recover. “Pirates may also be inadvertently playing the role of marine conservationists by preventing commercial over-fishing,” observed Voice of America in a 2009 article. Policymakers were quick to spot an opportunity. The naval blockade could never be a long-term solution to piracy – it was simply too expensive – but what if the international community could actually fix one of the root causes? While the policy may have been sound, it was never implemented to any great scale. Instead, international funding and resources went into the naval blockade, which worked. Somali piracy has dwindled to almost nothing, and shipping has returned in full force to the Gulf of Aden. That includes illegal fishing trawlers, who once again threaten to decimate Somalia’s fish stocks – which might just precipitate a resurgence in Somali piracy. “Illegal fishing was the pretext used by criminal gangs to shift from protectionism to armed robbery and piracy. And now the situation is back where it was, with large numbers of foreign vessels fishing in Somali waters again – and there is a real danger of the whole piracy cycle starting all over,” said John Steed, a former pirate hostage negotiator, speaking in 2015. Earlier this month, on March 13, Somali pirates hijacked a major commercial vessel for the first time in several years. With Somalia’s fish stocks once again under threat from unlawful international competition, is this the beginning of a new pirate boom? Not so fast, argues Walker. Times have changed. A lot of the pirate kingpins have been killed, arrested, or have earned enough money to retire. Commercial ships are a lot more savvy. And the risks for pirates have increased dramatically thanks to a far more muscular response from both private armed guards and naval patrols. But if the threat is ever to be entirely eliminated, it would make sense to help Somalia protect its fish. “The problem of illegal fishing does need to be confronted. Even if it’s not a direct cause for piracy, it is still a very prevalent problem which needs to be stopped,” said Walker.